Compare Water Heater Prices, Service and Repair Costs, and Water Heater Installation Cost for Leading Brands of Electric and Gas Water Heaters. Conventional, tank water heaters are the most common type of hot water heaters found in homes. They use electricity or natural gas, and store the hot water inside a tank that ranges in size, based on the needs of your home. In residential applications, 40-60 gallon tanks are the common size installed. Due to their large size, most homes have just one storage tank water heater installed, usually in a utility closet, basement, garage or other utility room inside or outside the home. The table below represents the top rated gas hot water heater replacement costs. We have listed the retail price range you would pay, if you drove to the store and purchased it yourself, or bought the water heater online and had it shipped to your home. The installed cost to replace a water heater listed below, is based on the average time it would take a licensed plumber to handle the gas water heater installation from quote to completion. For the purpose of these estimates, we are basing the comparison on average installation difficulty, permit and inspection costs where required, replacement of an existing hot water heater in the same location, with the same size storage tank, and disposing of the old water heater. All parts and supplied needed to complete the project provided by the contractor doing the work. For free estimates from plumbers in your area, click here and submit your project details. 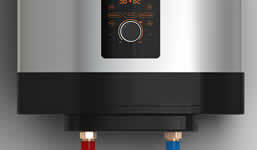 In this section, you’ll find the top rated electric hot water heaters with storage tanks. Retail pricing represents the estimated price to buy the water heater yourself, and the replacement column is an estimate of what a plumber may charge to provide everything needed (Supplies, permit, inspection, disposal, etc) to install a replacement electric water heater for you. The section below shows the cost of tank-style water heaters by their size. The average size 3 bedroom, 2 bathroom home, will generally use a 40-60 gallon tank, and may even be supported by point of use water heaters at different locations in the home. You can view the product detail plate on the side of your existing hot water heater to learn what size is currently installed in your home, or talk to a plumber and have them make the correct sizing recommendation based on your hot water usage for your home and family needs. Click here to get free quotes from professionals in your area, or to get an idea of hot water heater replacement cost you may have to pay a local professional. Tank water heaters need annual maintenance and service, and while they are very reliable, they do occasionally break down and need repair. In the table below, we’ll share the most common parts that are replaced on conventional water heaters, as well as the average cost for the parts, and installation cost. Like any mechanical home appliance, hot water heaters can have varying levels of difficulty in their installation or replacement. The easiest projects are those in a garage, indoor or outside utility closet, at ground level with very few obstacles in the way of the water heater itself. Other locations such as attics, basements, crawl spaces under homes, and cluttered utility rooms can add to the time it takes to complete the project, thus the installation cost will rise accordingly. 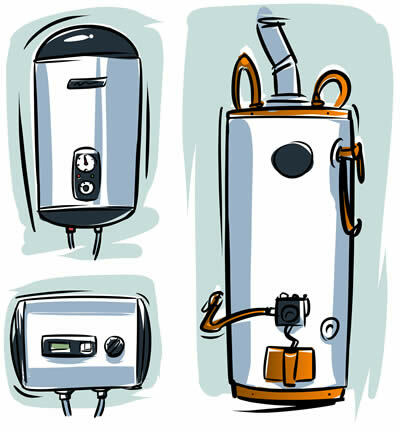 On demand, tankless hot water heaters have quickly become the preferred choice by homeowners. Not only do they offer higher efficiency than conventional tank-style water heaters, they take up much less space inside the home and when properly sized, you’ll never run out of hot water in the middle of a shower again! Tankless systems use electricity or natural gas (or propane) to heat the water before it is delivered to your shower, sink, faucet, etc. For homeowners that want high efficiency, gas tankless water heaters provide the highest return on investment. In the table below, we list the highest rated units available to consumers. For the purpose of this price comparison, we included the retail cost of the unit as found in local home improvement stores and online. In addition, we include the tankless water heater installation costs, which includes the whole house water heater itself, all materials and supplies need for the installation, inspections and permits as required, as well as disposal of the old unit and all labor required from a plumbing contractor to complete the project. In the table below, you’ll see top rated electric tankless water heaters. Just like the comparison above, we include a column for owner ratings, retail pricing of the unit itself, as well as an estimated tankless installation costs if it were done by a plumbing contractor providing an all-inclusive installation. Some electric water heaters require an electrician to run new wiring to the location of the installation, which will be covered in the incidental costs section, further down this page. When you install a tankless water heater, you need to be sure to get the right size unit for the number of sinks and showers that will be drawing hot water from it. This is rated in gallons-per-minute, and you’ll need to add up the needs of your home, factor in your lifestyle needs (more than one person showering at the same time, dishwasher running, sink, etc) and adjust the GPM needed for your home. A plumber will walk through this with you during the initial visit and help you decide which size tankless water heater to install in your home. Click here for installation price quotes from qualified plumbers in your area. Using the values above, determine how many will NEED to run at one time and figure out how many gallons per minute your new tankless water heater needs to support. In some cases, a single whole house tankless system is not enough, and you may need to two units. For example: Dishwasher, washing machine and one shower would mean: 3-9 gpm. Average this to 6 gpm to know the approximate size you need. Again, you should consult with a plumber in your area before coming to a firm decision on the size you need. As you compare the repair costs for tankless water heaters below, you’ll see we include a parts only, and parts installed cost. While the installed cost may appear to be slightly inflated as compared to the part alone, you have to keep in mind that a service call for a plumber to come out to your home, diagnose the issue and then repair it, can take several hours to complete. Most plumbers charge by the hour for general repairs, however they also use a flat-rate repair cost book for standard items commonly found in tankless water heater repair. Like other types of water heaters or appliance in your home, there are several factors that can cause you to pay a bit more for the installation cost of a tankless water heater. 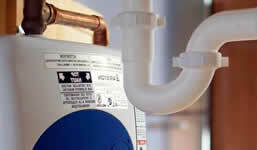 Location, venting, wiring and plumbing all contribute to the cost a plumber quotes for you. Compact and able to fit under most sinks, point of use hot water heaters offer an affordable cost and very flexible solution to homeowners. As long as you have access to electricity, you can easily add instant hot water to almost any location inside your home. The table below contains the highest rated point of use water heaters. The ratings are gathered from owner reviews and ratings at various leading web retailers and local hardware stores. They are not in any specific order and we update the table monthly. Fortunately, after a point of use water heater is installed, they are very low maintenance. Due to the low cost of this type of hot water heater, it almost makes no sense to even repair when they break. Just the cost of calling out a plumber to diagnose the issue may cost you more than a new unit. 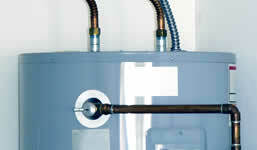 That said – there are a few things that could cause your small water heater to stop working. Loss of Water Source? – Is your water turned on in the rest of the home, or has the service valve been shut off to the water heater? Has the Circuit Breaker Tripped? – Since almost all point of use systems are electric, you should check your circuit panel to be sure the breaker didn’t trip off. No Hot Water, Everything Else Working Fine? If water runs through the unit but its no longer hot, the electric heating element may have gone bad. You can get a replacement heating element for under $50, however at this point, it’s worth it to just replace the unit. Installing a point of use water heater may be a DIY project that many homeowners can do themselves. However, you have to be aware that you need two things to complete the installation. A protected electricity circuit (ground fault) and a source of water. Many homes have garbage disposals that are wired to a ground fault circuit already, so a handy homeowner may be able to bridge off the existing wiring to the disposal. If you already have cold water piped to the area, tapping into the water line is as easy as your own handyman skills can take you. Copper piping may need to be cut, tee’d, and then soldered back into place. In almost all cases, we suggest to talk to a professional plumber before you try to install your own point of use system. You might be surprised how affordable it is to have a pro handle the work, versus having to pay them much more to fix plumbing or electrical errors you make on your own. 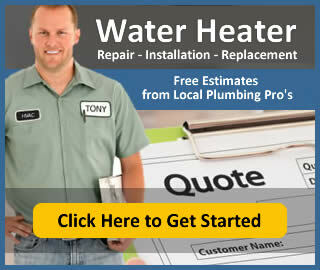 Click here for a free quote from a local plumber. By sharing what you paid for a water heater, you’ll help future visitors estimate their own costs.